Buildworld is an independent construction supply store based out of London that carries a wide selection of nuts, bolts, screws, and washers. Build world has the products you need for your next construction project. Check these online or at our Leicester Store. These are also known as carriage bolts. They're threaded and are most often used to bind wood to metal and wood to wood. They can be identified by their unique round, mushroom-like tops that help hold the materials in place and make it more difficult for people to tamper with them. These are threaded and have a "T" shape with a square, rectangular, or hexagonal top. The square and rectangular bolts were widely used in the past, but have since been overshadowed by the more popular hex bolt. 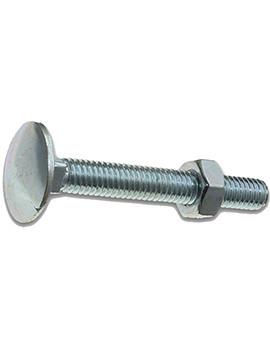 Regardless of the style, head bolts provide a firm hold and can easily be fastened to building materials with a wrench. These are "T" shaped, threaded, and have a mushroom top. Unlike coach and head bolts, they have "+" cross engraved into the head, which allows it to be tightened with a screwdriver. They're threaded and are held in place by a square nut. They don't have a top. They're threaded rods that hold two materials together, most often wood, metal, or concrete. These are threaded like all of the others. What differentiates them from the other products listed above is their wide variety of heads. The Phillips flat head is slotted with a single horizontal line on the top. Unlike flat heads, pan head machine screws have a mushroom-shaped top. Both flat and pan screw heads can be designed to be used by a number of different screwdrivers.